Courtney Lawes looks likely to miss Saints' crunch clash with Harlequins next weekend after being forced off at Sandy Park on Saturday. 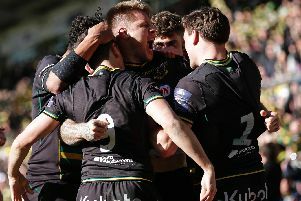 Lawes headed off for a head injury assessment (HIA) on the 20-minute mark and was unable to return to the field as Saints slipped to a 36-12 defeat against Exeter. He will now have to go through the necessary concussion protocols. And Mallinder said: "Courtney went off early and it was a head injury but the blow was more to the shoulder and neck. "He did fail his test so he will have to go through all of the protocols. "It's one of our big players and we'll be hoping all our big players are fit." Saints were without Stephen Myler, who will definitely not play against Quins due to a knee injury, Louis Picamoles (shoulder), George North (side), Tom Wood (shoulder) and Calum Clark (calf) against Exeter. And they will be desperate to get as many of those players back as possible, with Mallinder's men needing to win and deprive Quins of a losing bonus point if they are to stand a chance of finishing sixth in the Aviva Premiership. "Hopefully Louis, George North and Tom Wood will come through this week and we will be able to put out a strong side," Mallinder said. "I don't think any of them were fit to play at Exeter. "They all just needed a few more days. "None of them have trained properly this week, although they have been out running, particularly Louis and Tom Wood, who has got a sore shoulder. "It's where we're at and we've now got to make sure we look after the players. "We've got an A League final (against Gloucester) on Monday and we've got to make sure we're smart in our selection because next week is a massive game."